The Annenberg Center for Communication (ACC) at the University of Southern California invites applications for up to eight postdoctoral positions and one visiting scholar position. These Visiting Research fellows will take part in a major multi-disciplinary research initiative to explore the â€œThe Meaning of the New Networked Age: Innovation, Content, Society, and Policy.â€? We welcome researchers from various disciplines including anthropology, architecture, the arts, business, communications, computer science, design, economics, engineering, history, international relations, law, library science, neurosciences, political science, rhetoric, and sociology. ACC is a research institute devoted to the study of new media from a multi-disciplinary perspective. We are in a period of fundamental transformation in the nature of the networks that connect people, information, objects, and locations. But, what does it mean and what, if anything, should be done to guide the process? The ACC research program will explore the drivers of these changes, their meaning, and their implications for business and government policy. – The emergence of pervasive mobile and wireless networks. The ACC intends to convene a multi-disciplinary cohort of scholars to focus on a topic of pressing concern not well addressed in more established disciplinary and departmental institutions. The visiting fellows will work with the ACCâ€™s senior fellows and also will be expected to pursue their research in residence at the Annenberg Center during the 2006-2007 academic year. They will collectively be responsible for organizing one conference and a monthly speakers series, and to attend two weekly Fellowsâ€™ seminars of graduate, postdoctoral, and faculty fellows on the theme of the meaning of the new networked age. They may not hold any other appointment during the period of the fellowship. The postdoctoral fellowship is intended for scholars who have completed their Ph.D since 2001, but we also will consider researchers with at least four years of relevant, real- world experience. The ACC fellowship carries a stipend of $45,000 in addition to a limited amount of funds to support research and relocation expenses. The visiting scholar position is intended for a mid-career scholar with a well -established track record and demonstrated leadership and expertise related to the theme. The stipend will be commensurate with the scholarâ€™s current position. ACC will also provide a limited amount of funds to support research and relocation expenses. Applicants should clearly indicate whether they are applying for a postdoctoral position or the visiting scholar position. Applications should include a CV, a cover letter including a personal statement, and a brief statement of research goals in relation to the theme. Three letters of recommendation are to be sent directly by the writers (letters may also be faxed to 213-747-4981). Address all application materials to Elizabeth Harmon, Annenberg Center for Communication, University of Southern California, 734 West Adams Boulevard, Los Angeles, CA 90089-7725. Email contact: eharmon at annenberg dot edu. The deadline for receipt in our office is April 30, 2006. I found myself in the advantageous position of having both Yochai Benkler and Mimi Ito at the same supper table. I puzzled over what was the one question I would want them both to answer â€” something that went beyond framing particular practices of cultural production and its meaning. So, I asked them both â€” what is your future imaginary world? Based on what you know, your stakes, your opinions â€” your research â€” what would you aspire to create as a more habitable, sustainable world? Benkler gave a number of examples during his talk about how the network and some common super heros effected worldly change. While he was giving these examples, I quickly thought about a decision I had made in the morning about what shirt to wear. One option was my Daniel Ellsberg t-shirt. The other was a short sleeve buttoned number. I opted for the buttoned shirt, but the Ellsberg option lingered. 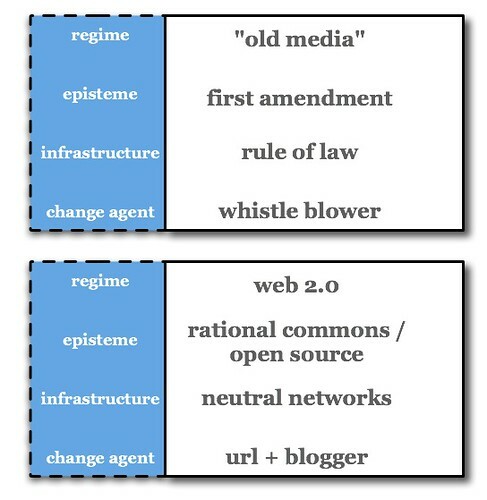 I thought about what it took to be an agent of change during the regime of “old media.” The agent of change, or one of them, was superhuman in their will, commitment and daring-do â€” it was the Whistle Blower. (As a matter of fact, that Daniel Ellsberg t-shirt was from a series of t-shirts that the artist / designer Raegan Kelly had done exclusively dedicated to Whistle Blowers.) What an effort and what stakes to be a super hero / change agent of that scale. How many of us could conceive of striving against “the Pentagon” (and everything else that systemically supports that institution) so as to publish some documents spirited out of the RAND Institute. Today, Ellsberg would just blog the Pentagon Papers. Open source, neutral networks would allow that. Even if the Cease & Desist letters came in, once it got out â€” one would be hard pressed to even find a way to expunge the documents from today’s P2P networks. The examples that Benkler gave of common super heros effecting worldly change came across as almost routine examples. Someone in a condo complex somewhere stumbles across some emails from some guy at some corrupt government contractor trying to screw over the American public. We chuckled at the fumblings of institutions that sought to suppress Diebold’s voting machine software and other similar “old regime” attempts at squelching the will of common, everyday super heros. It’s all routine, it’s just how things happen. The Ellsberg’s of tomorrow â€” the digital kids? â€” they’ll just register a domain name and set up a blog. They won’t even have to muster the ACLU lawyers out of bed. My own stakes and aspirations are that all of this networked publics “stuff” (to quote Mimi! ), will hopefully lead to a world in which individuals (digital kids) grow up with the sense that they are full enrolled, first-class participants in the polity and that they have a to-the-bones, intuitive sense that they can effect worldly change with some ideas, an articulate voice, and an $8.95 domain name. This is far more than simple civics 101 from the 1980s. This would be the sense that “I can make things happen and change the way things are. I can be a common super hero and, in fact, there are an enormous number of super heros in the world who right wrong and suppress evil, greed and wrong-doing. 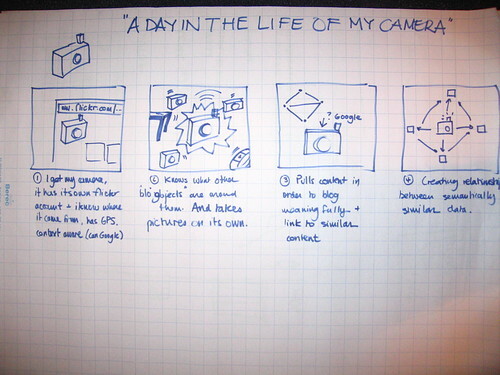 Why do I blog this? It’s the stakes: creating a world in which we (or the digital kids) have a sense of participation and a conviction that change is possible, and that individuals with ideas and aspirations for creating more habitable and sustainable worlds, can be common super heros â€” agents of change, without the kinds of burdens we normally associate with being a super hero..like lawyers fees and the threat of having your family’s life destroyed. I’ve been thinking about the relationship between space and networked things as I write this report with Nicolas Nova for our workshop on objects that blog and I’ve realized (without too much surprise) that that workshop and my thinking about “place” and networked publics are pulling together, particularly in the context of the Internet of Things. When the research cluster I am presently participating in â€” “netpublics” â€” presented its thinking on the role of place in the context of networked publics, I felt that it was important to consider how a world in which Things will alter the patterns of usage, movement and mobility with space. (I’ll capitalize Thing for now to distinguish between networked Internet of Things things and non-networked things, and so as to be succinct I’ll do an end-run around Heidegger, Kant and Latour.) And I’ll call the differentiated kind of movement and rules of occupancy within this different kind of place, motility, so as to emphasize what I think is a safe speculation: a world in which Things that co-occupy physical space are known (by the other occupants of that space) or assumed to have the ability to disseminate, record, and perhaps even put in context what happens in that space and circulate such within the network will change the patterns of use, the kinds of social practice that obtain, and the imaginary about that space. This kind of space and the rules of tenancy are different from space in which such “blogging” characteristics are not assumed about things. The easiest analogy is to think about how patterns of usage and the “rules of tenancy” for occupying space are altered when that space contains surveillance technologies. (By rules, I mean both the unwritten as well as the more formalized in terms of law, as well as social policy.) The work of the R&D collective The Institute for Applied Autonomy is one of the better examples of really bringing to the fore the way surveillance technologies changes the way we think about, move through, and generally occupy space. Their project iSee takes DIY plotted locations of urban surveillance and, using Google Map-like techniques (way before Google Map-like techniques were formalized), creates new pedestrian paths so as to avoid as much surveillance exposure for those wishing to stay uncharted. 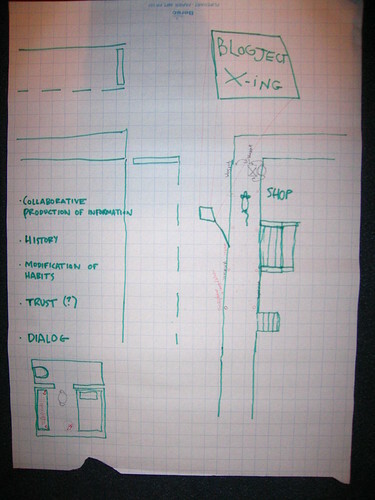 I am speculating here that the introduction of the “Thing” that is networked in such a way as to circulate within both physical space and networked space will changes the ways in which we occupy space, deserves closer attention by the community of folks working on explicating as well as making this new kind of networked place. My question about “place” How will a world of networked Things change our relationship to physical space? Can we lever the Internet of Things “meme” to design more habitable, sustainable World 2.0’s in this regards? Can we avoid the paranoia imaginaries or just plain deflating and moronic ad-sales-marketing usage scenarios of every Thing containing its own sales pitch and marketing promotion? What is a habitable World 2.0 when “pervasive” doesn’t mean that you can get online while riding a subway, but when it means extensive participation by the other co-occupants and companion species on the digital social network â€” Things. What are the “realistic” technology fictions of World 2.0? What’s the middle ground between the ad executives half-baked fantasies and the religious-paranoics Spychips alarmism? And why just the RFID? Please, why is the RFID the poster child of the Internet of Things? Is it because some dorkbotters inserted them subcutaneously and there will be more RFIDs than cockroaches in the world? Ever since this “blogjects” topic has started circulating, I’ve been asked lots of things, but two questions have come to the fore. 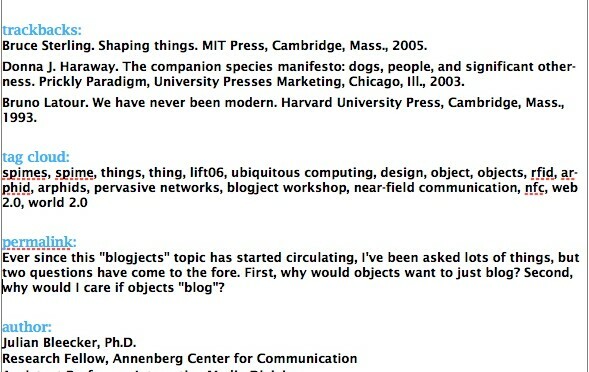 First, why would objects want to just blog? Second, why would I care if objects “blog”? In the longer essay, I have an explanation as to why I’ve been using “Blogject” instead of Bruce Sterling‘s Spime. The short answer is that Blogjects are kin to Spimes in a fashion, but I’m also leaving it to Bruce to shape this Spime concept in his current writing project. I can grok â€œSpimeyâ€? things, and register Bruceâ€™s technology fiction. As an engineer, I can make Blogjects now because the semantics are immediately legible to me â€” objects, that blog. Tonight, I can go into my laboratory and begin to experiment with what a world might be like in which I co-occupy space with objects that blog. To make Spimey things â€” well, I will have to wait for Bruceâ€™s technology fiction to reveal itself in the form of his forthcoming treatment, something I eagerly await. I read Bruceâ€™s Shaping Things as a field guide to the technology fiction I imagine he is presently writing about. Out of that field guide I up with a tiny nugget of insight: if thereâ€™s one thing Spimes will do, they will most certainly â€œblog.â€? Because I’ve been slacking on blogging and needed something to publish, I thought I would put up the working abstract for the time being. The Internet of Things has evolved into a nascent conceptual framework for understanding how physical objects, once networked and imbued with informatic capabilities, will occupy space and occupy themselves in a world in which things were once quite passive. This paper describes the Internet of Things as more than a world of RFID tags and networked sensors. Once â€œThingsâ€? are connected to the Internet, they can only but become enrolled as active, worldly participants by knitting together, facilitating and contributing to networks of social exchange and discourse, and rearranging the rules of occupancy and patterns of mobility within the physical world. â€œThingsâ€? in the pervasive Internet, will become first-class citizens with which we will interact and communicate. Things will have to be taken into account as they assume the role of socially relevant actors and strong-willed agents that create social capital and reconfigure the ways in which we live within and move about physical space. Bruce Sterling. Shaping things. MIT Press, Cambridge, Mass., 2005. Donna J. Haraway. The companion species manifesto: dogs, people, and significant otherness. Prickly Paradigm, University Presses Marketing, Chicago, Ill., 2003. Bruno Latour. We have never been modern. Harvard University Press, Cambridge, Mass., 1993. In quick words, improvising: It is a proposal to study collaboration amongst scientists, engineers, and artists through the lens of science and technology studies. I want to understand the particular ways in which art/emerging-technologists work within the DIY sensibility, along with collaborations with discliplinary engineers/scientists to create a differentiated ecosystem of research & development practices. Like..what does it all mean when engineers and artists get in the room and work together? It can’t all be just about aesthetics, can it? Isn’t there something about the nature of those collaborations that has the potential to produce some other kind of design practice that reaches beyond what other formal R&D practices are able to produce? Like, mixing artistic sensibilities with engineering sensibilities seems like it would be a potent way to create richer designed experiences, or fashion designs that create an imaginary for more habitable worlds, or other things that go beyond the narrow tenents of traditional R&D? No? Am I wrong? I think I’m on-point here, but I doubt I was able to get the point across in the short time I took to write the grant proposal. Oh well. There’s next year, too. Reviewer 1: What are the broader impacts of the proposed activity? Reviewer 2: What are the broader impacts of the proposed activity? The relentless administrative demand for “inter-disciplinary” or synergistic work in academic settings over the last decade is badly in need of historicization. Crossovers between technical and humanistic disciplines have, intermittently since the 1960s, represented to many knowledge-making institutions (universities, museums, funding agencies) the best hope for innovation and productivity. This project is one of very few I have seen that asks questions about the cultural origins and meanings of that demand, and its central case (art-and-technology collaborations of the 1960s, and subsequently) seems well suited to answering those questions. However, support for interdisciplinarity in America other developed nations has been, as noted above, intermittent and has been vigorously fought by scientists and humanists alike. It is not clear to me that this study, as presented here, has the cultural grounding necessary to track this complicated story or to draw general lessons about disciplinary behaviors. This study may need a much broader examination of the customary division between high-culture and science/engineering activity in which to ground its study of how different cultural practices “‘think’ ‘make’ and ‘do'” (4) to achieve the interesting and important findings it seeks. That is a very, very helpful remark. It will be played out in the next iteration of this, for certain! I do not recommend supporting this proposal. It is filled with jargon and vague references to knowledge production…As it stands, he will be going on a fishing expedition that takes him around the world. This proposal requests support for a study of collaboration among scientists, engineers, and artists. The proposal puts forth numerous questions that might be asked in such a study and suggests a number of companies that might be visited and individuals that might be interviewed. The proposal also invokes STS methodology and cites some of the literature of that discipline. However, I do not find a systematic or coherent set of well-developed questions, nor do I see a coherent research plan that would suggest that a coherent well-focused book would result. The proposal on the one hand mentions numerous individuals and possible focuses of attention; on the other hand it is overly general. It does not contain a developed theoretical methodology or a well-worked out research plan. Nor is it at all clear what the resulting product from the research would look like. As a result, I would not recommend that this project be funded. This is a request for support of a research project that studies the collaborations among scientists, engineers, and artists. However, the reviewer did not find the research plan and theoretical approach well enough developed to merit funding. This proposal initially suggests an extremely rich approach to questions about differences and commonalities among seemingly disparate cultural fields: science and engineering on one hand, art on the other. Its main subject is Billy Kluver’s Experiments in Art and Technology (E.A.T. ), a Bell-sponsored project inaugurated in the 1960s that resulted in a series of collaborations between high-tech experts and artists of many media. It also plans to examine subsequent collaborations based on that model. The study proposes to consider art and technology as symmetrically as possible: In both spheres it says it will identify habits of institution formation, work practices, valuations of knowledge, and other categories of productive and evaluative work. The author promises to compare “measures and meanings of innovation” in single- and multi-disciplinary enterprises (5). In so doing, he would help us understand what it meant in the 1960s (and means today) to posit not just a commensurability between scientific and aesthetic creativity, but also a societal benefit to be derived from collaborations between the two spheres. I am somewhat concerned about specific questions and aspects of the project’s research design, and have some doubts that it can fulfill its goals as now planned. Some of the inconsistencies and vagueness in the proposal may arise from the fact that the author “has not yet determined what cases to use” (4). The lack of concrete detail is worrisome (Who did what work, where, and when, for the E.A.T. projects? What kinds of decisions about artistic or technological matters or patronage were made, and which matter to the author’s thesis, and why?). I am also concerned about a lack of cultural context, which might leave the important and incisive questions the author poses with only partial or misleading answers. First, what exactly is the “enduring legacy” of Kluver’s work? (5) Although the author cites “easily thousands” of collaborations between science, engineering and art since E.A.T.’s day, in fact technology-based art remained deeply stigmatized in conventional art worlds for at least 15 or 20 years after E.A.T.’s founding. While some technology-based art has certainly found support since the late 1980s, traditional mediums retain their dominance even today in many venerable scholarly settings and at the highest art-market levels. If some critical venues, and some corporate supporters, have established significant advocacy for art-and-technology collaborations, their departure from other historically prestigious avenues needs to be thoroughly problematized. E.A.T. represented a minute portion of American and European high-culture activity in the 1960s; technology-based art still competes today with a much larger and more popular array of conventional kinds of art-making. If E.A.T. offered a template for either corporate R&D or art-world innovation (7), it was not a pervasive model. It is absolutely worth studying, but perhaps as an exception to rather than a norm of corporate or aesthetic disciplinary behavior. In art and scientific spheres, many voices decried the contamination of one practice with the goals or techniques (or practitioners) of the other. Some history and philosophy of technology from the 1970s, 1980s, and 1990s sought a humanist infusion through art or literature; but many engineers worried (and still do) that humanities requirements were diluting the value of college engineering degrees. Similarly, many art critics were utterly dismissive of technology-based art through the 1980s, until post-modernist critiques gains a considerable foothold in the mainstream art world. In the 1960s that firewall between art and science was challenged, but not by everyone and it was certainly not dismantled, as a glimpse at science and art curricula (and funding or criticism) today instantly testifies. Some of these matters are explored in Matthew Wisniewski’s very detailed recent dissertation (Princeton, 2005), which considers E.A.T. in the larger context of cultural valuations of aesthetic and technical innovation. These tensions are not addressed in this proposal, which nonetheless claims to analyze a representative instance of science and art activity. While the E.A.T. collaborations and their offshoots represent an ambitious and interesting intellectual undertaking, and a moment in which American corporate culture reconsidered its role in the production and consumption of high-culture products, this proposal remains somewhat unclear about how it will analyze its subject. Its rating is based on both its intellectual merit and impact. So he doesn’t know what he’s producing, what questions he asking and whom or what he plans to investigate. That’s OK at some point in a research design but not at the point where one asks for the money to do it. The project proposed here would contribute a much-needed critical examination of initiatives in â€˜science/art’ collaboration. In researching these initiatives the PI promises attention to ‘the contingency of knowledge production and the social-historical character of art, science, and engineering practices,’ and to the degree that the project explores these issues with some degree of specificity it will be an exciting contribution to STS. The orientation to the interests and agendas that inform these initiatives, and the politics regarding criteria of success, is welcome as well given the predominately celebratory accounts that are available. I appreciate also the re-focussing of attention from the influence of science and engineering in the (new media) arts, to the question of whether and in what ways the traffic flows in the other direction. And I think the use of the E.A.T. â€˜experiment’ as a way in to these questions seems extremely promising. The PI is in many ways ideally positioned to carry out the research. He has a track record of innovative cultural research in the area of computationally-based technologies (e.g. his studies of Sim City), expertise in relevant areas of technical practice, knowledge of relevant sites and networks, and an institutional affiliation directly relevant to the focus of the research. 1. The proposal tends toward generality and repetition, rather than digging into the questions sufficiently to give us more of a sense for the issues and the direction of the argument. As just one example, on p. 3 there’s a reference to ‘work practices typical of the modern sciences and engineering.” This category is a large one; it would be good to clarify more specifically what work practices the proposal will address. I suspect that this would be a stronger proposal if some of the initial survey work had been done. 2. While the terms ‘inter- and transdisciplinary’ may well be established parlance, given their centrality to the project I would have liked to see them discussed, particularly in terms of similarities and differences in their implications. While there is mention of a critical consideration of how the categories scientist/engineer/artist are mobilized in these discourses, at other times the disciplines seem taken as given, rather than as themselves enacted through the discourses of disciplinarity. It’s crucial to get at the ways in which these collaborations restage as well as trouble disciplinary boundaries. In this regard I miss as well an orientation to the actual material practices through which practitioners acquire hybrid skills and sensibilities through their work together. What are the conditions of possibility for, and implications of, that work? 3. It would be good to clarify the sense of â€˜archaeology’ being cited p. 4. And how, more specifically, will the work of Foucault and Haraway be a resource? 4. The reference on p. 2 to â€˜third world’ scientists and engineers seems a bit gratuitous. How is this taken further in the proposal? 5. To the list of laboratory studies on p. 5 it would be good to add Michael Lynch’s â€˜Art and Artefact in Laboratory Science,’ as well as recent discussions within both art history and STS on relations of art and science. 6. The workplan emphasizes interviews with directors, â€˜thought leaders’, etc. I would have liked to see a greater emphasis on engagement with practitioners as well. This is tied to the question of the relation between rhetorics of inter- and transdisciplinarity and material practices raised in (2) above. 7. I wonder how the â€˜People and Practices’ lab at Intel incorporates the arts? A book that would trace the history of science-art collaborations and provide a critical contextualization of them would be timely and valuable, given the currency of these initiatives and others aimed at reworking disciplinary boundaries in other fields. The PI is also well positioned to bring the results of this research back into relevant pedagogies. The planned use of a blog as a research tool could also yield methodological as well as substantive insights. An extremely promising project by a PI well-qualified to conduct the research, albeit that the proposal would be strengthened by greater specificity. The project proposes an interesting a potentially important topic: the study of the value and meaning of collaborations between artists, scientists and engineers from a variety of perspectives and goals from the perspective of social studies of science. As outlined in the proposal, however, the project is vaguely described and loosely planned so as to raise the question of whether there will be any concrete outcome or any answers to what he describes as “likely” or “suspects” may be the case. The applicant suggests that the project will benefit community understanding, engineering and scientific education, etc., but it is difficult to see how, in that no mechanics for dissemination via specific contacts are provided. I do not recommend supporting this proposal. It is filled with jargon and vague references to knowledge production. There is only one case study [EAT] mentioned, while the possibiiity of finiding others to round out a book-length study is only alluded to. There needs to be evidence that the applicant has done some homework for the project by providing a list of case studies, a list of individuals to be interviewed, a bibliogrpahy that includes citations to work in the EAT archive at the Getty, to the large body of work by artists, art critics, theorists on the art-technology nexus. As it stands, he will be going on a fishing expedition that takes him around the world. Lift06 (Life Ideas Futures Together) is a conference in Geneva organized by Laurent Haug in collaboration with Nicolas Nova, Steven Ritchey and John Staehli. It brought together a nice diversity of participants ranging from Microsoft geeks to NGO like Amnesty International, to open society pundits like Cory Doctorow, creators, dudes and doodlers like Ulla-Maaria Mutanen, Jyri EngestrÃ¶m, Matt Jones, RÃ©gine Debatty, Timo Arnall, Aram Armstrong, Alexandra Deschamps-Sonsino, Jean-Baptise Labrune, Fabien Girardin, bloggers Robert Scoble, Bruno Giussani, RÃ©gine Debatty, designers Victor Szilagyi, Haiyan Zhang, etc., etc. The mix was sufficently diverse and collegial and casual that it felt remarkably productive. The full list of attendees is available here. It was a very transparent organization process. The conference came to be through a public wiki and blog and all manner of insights and ideas for the structure were shared in a reasonable fashion. Best yet is that all the talks are available for your eyeballs and earballs. I had the good fortune to participate in Lift06 as Nicolas Nova invited me to co-facilitate a workshop on Blogjects or “objects that blog.” (Some notes are here. The back story on this harkens back to a short blog post I scribed while digesting some Bruce Sterling, and preparing some remarks to launch a discussion on Shaping Things for the Southern California Digital Culture Discussion Group. The wonderful thing about Lift06 was that it was like what I would want O’Reilly Etech to be â€” creative, out of the box innovators, tinkerers, makers, funders, idea, but with diversity of goals and objectives (and, of course, about 6 times cheaper.) I think Etech is great â€” I’ll continue to go, and present when its right and relevant â€” but what Lift06 was able to do was open the audience up. It wasn’t just about the Tribe of Alpha Geeks and friends-of-Tim getting together to share with each other what they already know about each other or to pitch their latest VC bait. Lift06 was opportunity to hear, discuss and participate. It was a chance to be a part of the emergence of new ways to create, maintain and knit together networks of social relations and move social formations in a way that will hopefully create new habitable worlds. Enough tech geek to keep me happy and excited and eager for Lift07, and enough conversations around reinvigorating existing and creating new social practices to make me feel like I was a part of something that was circulating culture in a promising vector. One of the upsides alongside of the downsides of the way the network sustains and circulates cultural production is this time and labor saving device â€” other people’s blogs. Rather than reporting all that people talked about, I can focus on short insights into what was important to me. There was a phalanx of bloggers in attendance, so full coverage should be available through an easy google or technorati search. Or bloglines or whatever. A fun, magisterial re-articulation of why “things” matter. Sort of resonant, in hindsight, with Thomas Madsen-Mygdal wonderfully titled talk (see below). Sterling’s been an important intellectual influence over the last several months, and it was great to hear him and chat with him. Glad that Nicolas was able to get him to attend. Why was this imporant to me? Fleshing out the relationship between architectural objects and interactions of those objects with social beings. It was nice to finally meet Jeffrey and chat about his take on architectural objects, Blogjects and other such things. Jeffrey also used an increasingly noticed presentation technique (actually, I don’t know how new it is, but..) of compelling interaction with the audience by presenting a few points, examples, etc. and then soliticing their input through a blank slide and a simple question. It moved the presentation into a more interactive mode, which in the context of things such as Lift06, is important. The audience are peers and colleagues. They have ideas and a conversation makes much better sense, at a certain time. Oof. Despite her modesty as a knowledge producer (I think she too quickly mistakes herself as just a reporter and aggregator of exciting things), this talk was fantastic and I’m hoping she can give it (or part of it) for the IMD later this winter. The relationships amongst art, provocation, social-politics, and aesthetics. Very articulate and insightful. Another great presentation in the Lift06 canon. Why was this important to me? Never met this bloke, and was skeptical when he asked us all to shut our laptops (disclaimer: mine wasn’t open, although I almost knee-jerked to open it, but came to my senses and thought this would pointless and, worse, obnoxious as I was sitting in the front row, square with Thomas’ podium. Also wondered if he would close his..) Thomas is the founder and producer of reboot, an event which I have not been to, but which sounds Lift-like and by accounts was the inspiration for Lift. Why was this important to me? Had a chance to talk with Jeffrey Huang about the relationship between things, interfaces between things and social beings, and new kinds of interaction spaces. Jeffrey seems interested in participating a follow-on workshop. Matt Jones’ flummoxed look when I explained that I had no idea who Gerry Anderson was, even after professing a strong affinity to Space 1999. Introduction to Thomas Madsen-Mygdal and learned more about Reboot and explained the Blogject project and the cultural-politics that motivate it. Why do I blog this? To try and give a sense as to why Lift06 will be an important forum for making and creating more habitable worlds. It’s the relationship between open-society and open-source and what these can yield for the creation, maintenance, sharing and circulation of culture and the knitting together of diverse networks of earthly inhabitants. What’s Lift06? Lift06 (Life Ideas Futures Together) is a conference in Geneva organized by Laurent Haug in collaboration with Nicolas Nova, Steven Ritchey and John Staehli. It brought together a nice diversity of participants ranging from Microsoft geeks to NGO like Amnesty International, to open society pundits like Cory Doctorow, creators, dudes and doodlers like Ulla-Maaria Mutanen, Jyri EngestrÃ¶m, Matt Jones, RÃ©gine Debatty, Timo Arnall, Aram Armstrong, Alexandra Deschamps-Sonsino, Jean-Baptise Labrune, Fabien Girardin, bloggers Robert Scoble, Bruno Giussani, RÃ©gine Debatty, designers Victor Szilagyi, Haiyan Zhang, etc., etc. The mix was sufficently diverse and collegial and casual that it felt remarkably productive. The full list of attendees is available here. I had the good fortune to participate in Lift06 as Nicolas Nova invited me to co-facilitate a workshop on “objects that blog.” The back story on this harkens back to a short blog post I scribed while digesting some Bruce Sterling, and preparing some remarks to launch a discussion on Shaping Things for the Southern California Digital Culture Discussion Group. One of the upsides alongside of the downsides of the way the network sustains and circulates cultural production is this time and labor saving device â€”Â other people’s blogs. Rather than reporting all that people talked about, I can focus on short insights into what was important to me. There was a phalanx of bloggers in attendance, so full coverage should be available through an easy google or technorati search. Or bloglines or whatever. Why was this important to me? A fun, magisterial re-articulation of why “things” matter. Sort of resonant, in hindsight, with Thomas Madsen-Mygdal wonderfully titled talk (see below). Sterling’s been an important intellectual influence over the last several months, and it was great to hear him and chat with him. Glad that Nicolas was able to get him to attend. Why was this imporant to me? Fleshing out the relationship between architectural objects and interactions of those objects with social beings. It was nice to finally meet Jeffrey and chat about his take on architectural objects, Blogjects and other such things. Jeffrey also used an increasingly noticed presentation technique (actually, I don’t know how new it is, but..) of compelling interaction with the audience by presenting a few points, examples, etc. and then soliticing their input through a blank slide and a simple question. It moved the presentation into a more interactive mode, which in the context of things such as Lift06, is important. The audience are peers and colleagues. They have ideas and a conversation makes much better sense, at a certain time. Has anyone discussed the submissions process for professional conferences â€” the important, if infamously flawed, social mixer for the knowledge production class? No? I think it would be worth taking the time to do start a short introduction to the topic. Let’s give it a shot. In the world of academic, scholarly knowledge production you produce knowledge. What gets to count as “production” includes circulating your ideas as they are framed by experiments or studies, the results of those experiments or studies. Amongst the other knowledge production practices (talks, seminars, colloquia, workshops, keynotes â€” various means of “holding forth” on your special insights within a miniscule, boggish corner of “the field”) the experiment or study is the Big Kahuna. You get appropriately “long” venues for dissemination (10 pages or so for a paper) presented at an professional society conference. There are statistics somewhere about this whole business and some indications that most of this stuff is kruft that gets lost in the hinterlands of digital document depositories. A few get to stand out, but most â€” let’s face it â€” are penned and published to add a line to the CV. Nonetheless, we make our incremental contributions to “the field.” No news there. The process goes like this. You identify your professional affinity group â€” I’m thinking some of my work is good for the Computer-Human Interaction set, best represented in most of the western world by the ACM SIGCHI â€” then begin parsing the various calls-for-papers/projects/submissions/proposals and thinking about what your current harvest of ideas, projects, experiments, study results, etc. are appropriate for responding to any number of those calls. So, over the last two years, I’ve attempted to become a lively member of that society â€” participating in a workshop in 2004, involving myself in the student design competition as a jurist, and, this year, submitting some of my junior-tenure-track ideas to a workshop, and some early laboratory research (partially funded out of my own pocket) for the SIGCHI’s new Work-in-Progress call for papers. This year for me continues 2006’s theme as My Years of Accumulating Rejection. It’s okay â€” as several of you out there know, I have deliberately adoped this life style of accumulating rejection. It’s not the philosophy of The Downward Spiral, but one that encourages me to attempt many things, even if I feel that achievement of those things may be far beyond my range. Shakespeare wrote about that â€” something like, it’s better to eat something that looks weird than not to eat at all, or something like that. Okay, what better way to describe the magic of turning your brilliant ideas into scholarly and intellectual coin than a real life example of such an attempt failing miserably? I’ll go ahead and not bother to remove my name, as my innocence is well known to be suspect anyway, and the hideous process I describe in what follows is protected through a process that should be familiar to anyone who’s watched an episode of CSI â€” the anonymous grand jury, or in this case, the anonymous reviewer. Work-in-Progress submissions provide an opportunity for both practitioners and researchers to present a concise report of new findings or other types of innovative or thought-provoking work relevant to the HCI community. Like interactive posters of the past, Work-in-Progress focuses more on visual presentation and discussion between the author and attendees around the poster. Accepted work will be published as 6-page papers in the CHI 2006 Extended Abstracts. This submission category aims to attract attention from a broad range of disciplines covering a spectrum of topics and methodologies. The following topics are especially encouraged: multidisciplinary work, social impact of technology, design research, human-centered design and innovation, and cross-cultural design. We encourage submissions from all of CHI’s communities: design, education, engineering, management, research, and usability. I’m a new guy. I like the idea of WiPs because at this point in my career â€” all my work is “in progress.” I have yet to do a full-fledged study or generate such as could go into a full paper with any hope of being accepted. So, I sent up a balloon to check the conditions in the stratosphere of scholarship that my trusted mentors and their peers regualarly jet about in. I had been working on a project that some of you may know about â€” using a nifty, albeit expensive (for my self-fundedness), three degree of freedom accelerometer I came across during a research expedition to Japan. This thing is quick. It’s got negligible drift. I can program computers with the almost-the-best of them, so I can DIY hack it to talk to a whole bunch of things, including an open-source game engine called Torque, and a Max/MSP patch I wrote to control a QuicktimeVR. Now, with this sensor attached in various ways to lightweight, portable things like small TabletPCs (8.4″ display) and even smaller TabletPCs (5″ display), I now have my very own DIY, non-NSF funded platform for research into the use of fast, negligible drift, three-degree of freedom accelerometers as an interface element for first-person perspective electronic play and cinematic experiences..
What does that mean? It means I am working on (and making some decent progress) on using this kind of sensor as a game controller. I’m also working on (and making really decent progress) on using this platform to create a kind of cinematic surround experience using a portable visual display. Imagine holding up your PSP and having the point-of-view of a game change as you turn around or look up. Imagine a location-based visual story where you follow a character (cf. Janet Cardiff’s visual story projects) and can pan left or right or tilt up or down and have the camera’s perceived POV change precisely in synchronization. Evaluation of systems, techniques and other phenomenon relevant to HCI – this can include either experimental or other types of evaluation. Reflections from Practice – lessons learned, broad conclusions, or principles derived from practice, backed by thought-provoking and well-substantiated analyses. Design Briefings – accounts of the design (rationale, process, outcomes and evaluation) of an innovative application, user interface, or system. Methodologies and Tools – new methods, processes, techniques, and tools for use in interactive system design and development. Here I’ve got a DIY platform that I think is thought-provoking, innovation, uses some new tools (open-source game engines, Max/MSP, a new sensor), it’s certainly brief (you only get 6 pages, with references and images and everything. Let’s call the jury in. What did the reviewers say? results from their informal experiments either. viewpoint, voice and gesture annotations on a spatially-aware display. defined their intended innovations at this stage. and mobile cinematic experience are described. However, exploring more modalitiies for mobile computing is a big topic. findings of the work should also be described in a more focused way. An important reference is missing. Software & Technology, CHI Letters 2 (2), pp. 91-100.
a bit more about the experiences of the users. roadmap to further improvement of their work. Hmm. Okay. So..what do I think of what the reviewers think? I find it implausible that a new work would be dismissed based on the fact that previous work in the area has been done. Our approach and the content of our experience are, based on my review of the literature, distinct. And, certainly it is the case that continuing a vector of research, seeking additional innovations is part of the process of advancing knowledge. For instance, the “DJ Boombox” mentioned further below is another gesture-based interaction scenario, yet it contributes additional material to the field. I’ll eat my words if this reviewer can find prior art demonstrating work that uses 360 degree azimuth, +/-89 degree tilt, with negligible delay and drift as an interface to an electronic game and QuicktimeVR experience. Drops in prices of components such as accelerometers likely means that more and more researchers are likely to contribute innovative ideas to their use. Cost and innovation are inversely related in an open community of research. It is the rare researcher who would simply do the same thing because she can get her hands on some cheap parts. As financial accessibility yields increasing experimentation we can expect increasingly innovative usage scenarios, designs, projects which is an argument suggesting that more papers, works-in-progress, posters, workshops, etc., should appear, not fewer. Arguing against a vector of research on the basis of a proliferation of components just doesn’t make sense. The same sort of argument could be made against bounding papers because they’re components have been commercialized. DIY cultures have embarrassed formal R&D communities such as ours with their innovations through low-cost, clever, insightful and entirely legitimate re-mix of existing commercial designs. Reviewer 2 suggests including Hinckley’s early paper (from UIST ’00 â€” or from CHI Letters), while Reviewer 3 suggests that we have too many references. At some point it is necessary to either highlight new, previously under represented literature, or continue to cite the same literature in every paper on a particular topic. It is this author’s opinion that a paper should contribute to the field not only in its substance but in its indexing other than the usual relevant prior art, not always the same prior art. Work-in-progress suggests that we’re clarifying our approach, precise research questions, techniques and methods. It seems that this (as well as the other) reviewer is calling for more finality in a work-in-progress, which is counter to the objectives of the call, particularly so as to receive early, substantive feedback from colleagues in the field. It is my understanding that a work-in-progress is distinguished from a completed research project in that it has not yet or has not completely formed experimental results. Therefore, I would claim that emphasizing the ground work within the very short amount of space allocated would include the reference material and prior-art that frames the work-in-progress, not experimental results for work-in-progress that has not yet conducted formal experimentation. The expectation for qualitative or quantitative data in a work-in-progress does not seem to keep within the work-in-progress idiom. I’m not sure how such data would be presented when the work is not complete and experimental design is “in-progress.” And, I’m not sure it is helpful to refer to a work-in-progress as “too much” a work-in-progress. Does that mean it’s been worked on too much, or it’s progress has continued too long? In either case, a roadmap to further improvements could really only be properly assessed at the completion of a study, rather during the process of conducting the work. But wait! There’s more! It’s a 12 hour flight from Frankfurt to LAX, not counting the Munich-induced weather delays, and I’ve got two fully charged batteries and coffee just for ringing the call button! In all cases I found the reviews vaguely helpful, but dismissive in a way that suggests that the new WiP category has, in this case at least, missed the mark in providing an opportunity for researchers to “present a concise report of new findings or other types of innovative or thought-provoking work relevant to the HCI community.” It was our intent to provoke thought â€” not present data, nor to make conclusions. Considering the review criteria â€” contribution and benefit, originality and innovation, clarity â€” I would ask that this submission be re-evaluated, with an explicit focus on responding to the paper within the context of the three criteria (Contribution and Benefit; Originality and Innovation; Clarity). Alongside of CHI2005, for instance, our work is arguably innovative and original, and contributes to what is in fact an underrepresented, and important area of CHI research. At CHI 2005 there were a limited number of projects that focused their investigation on the use of accelerometers for manipulating visual displays, and all were late-breaking results â€” no full papers. It would seem that there is interest, but no furtherance of this important research vector within the field. I would challenge the reviewers to point to a completed research project using the kind of interface modality we are researching, with the technical characteristics (fast-acting, low-drift, absolute measured, 3 degree of freedom sensors) and the semantic characteristics (game point-of-view control, control of point-of-view in a cinematic digital visual experience), which are innovations described in our paper. Having presented this project at several talks, and informal presentations to visiting colleagues, I have yet to come across an individual who was aware of this sensor device, which has the unique characteristic of an unprecedented ease-of-use and off-the-shelf availability. I’m sure a large community of researchers would benefit from being made aware of this technology and our work. Similarly, the growing and important emphasis on play and games within larger cultures suggests that CHI should participate in the innovation of new styles of game interaction and interface. Arguably, this work-in-progress makes just such an contribution. 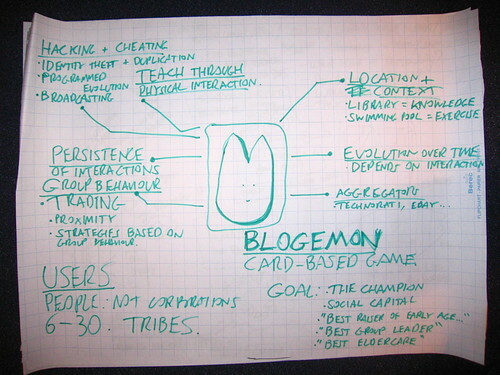 At CHI2005 I found three candidate instances of prior art. One project that used accelerometers as an entertainment innovation, and focused on movement as an interface control (The DJammer: “Air Scratching and Freeing the DJ to Join the Party.) Another used accelerometers but with significantly reduced sensor range, acuity, and with fewer degrees of freedom than the three degree of freedom accelerometer we use in our project (“The Virtual Raft Project: A Mobile Interface for Interacting with Communities of Autonomous Characters.”) A third that used accelerometers as a gesture interface for interpreting hand movements, thus not directly within the idiom of one-to-one use of absolute movement as a way to control point-of-view within a visual world. I find it hard to support the overall conclusion of the reviewers that this project does not warrant inclusion in the WiP sessions if for its contributions and innovation alone. As to the clarity of the writing or technical issues if there is a typo or a misaligned image, I think that should be subject to reconsideration as a professional courtesy â€” everyone makes this mechanical errors, and CHI professionals in particular should understand the challenges spelling checkers have when a misspelled word is another dictionary word spelled correctly. Overall, I found the WiP reviews, despite the expertise of the reviewers, to be without foresight. Although I would expect SIGCHI to perhaps be conservative in the area of “long papers”, I am quite surprised that this new WiP call would reject work such as this. Why? I don’t know. They didn’t send reviews and I’m still waiting to hear back from the organizers after I sent a note asking for comments. Might not hear back. So much for transparency. I suspect they were looking for less fluffy such things and wanted some stats on privacy technology and such all. So, there you have it. It’s a tough game. I enjoy playing it immensely, despite the pain. I don’t have expectations that I will obtain more than an average and low acceptance record, particularly because I play at the boundaries of acceptable theory, objects, practice and approach to knowledge production. That’s okay â€” I enjoy being at the edge, much more than in the center. I am also much more satisfied than this post might sound â€” not perfectly satisfied, but okay. And I am really happy to have a mechanism for circulating what I think to a wider audience. Sharing such things as these reviews makes it a bit more tolerable. Accumulate Rejection. It means you’re out there taking risks, probing for your audience, and continuing to circulate ideas, insights and culture. It’s kind of like being an actor, going on auditions. Or worse, a comedian, playing the circuit. 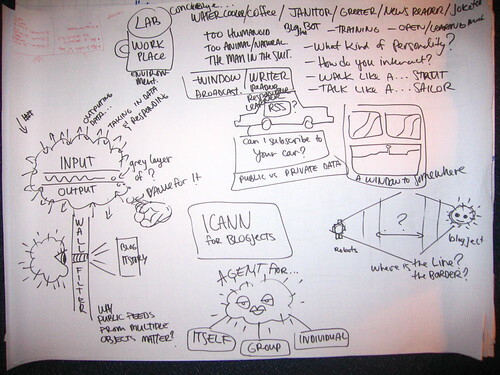 These are skeletal notes and inscription ephemera from a Lift06 pre-conference workshop on the topic of objects, things, networks, pervasive media â€” all cobbled together under the neologism “Blogjects” â€” objects that blog. Details and a write-up are imminent! I’d say the workshop was an unqualified success. Here’s my presentation as a PDF of the Keynote slides with notes, and here is a (28.6MB) MP3 of me speaking while showing those slides. Audio of the four workshop project presentations is available. Jean-Baptise Labrune has put up some of his notes from the workshop on his wiki. Aram Armstrong has posted his video from the workshop. Some photos from the workshop are collated here. Nicolas and I will be collating the material from the workshop into a report soon. Prepare for a near-future follow-on workshop on Blogjects, Things, and Spimes.